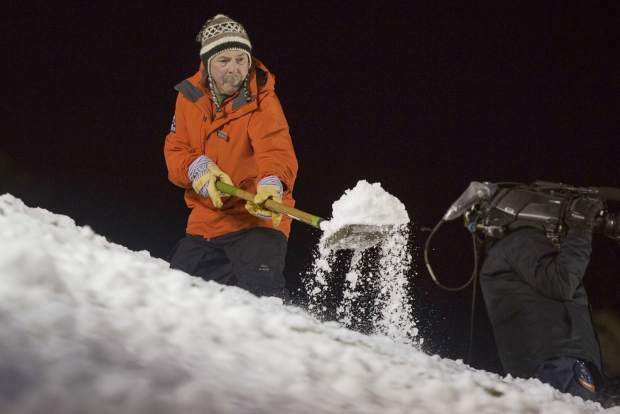 A volunteer for the Visa Freestyle International Ski World Cup event at Deer Valley scoops loose snow onto the aerials course during a break in competition in January. PARK CITY, Utah — It’s about two months until the 2019 FIS freeski, snowboard and freestyle World Championships kick off Feb. 1 with snowboard cross on Solitude Mountain. Organizers expect the International Ski Federation event, which is set to take place at Deer Valley Resort, Park City Mountain Resort and Solitude Mountain Resort, to be the largest winter sports event in the Park City area in terms of spectator turnout since the 2002 Winter Olympic Games. Putting on such a large production is going to require a lot of work, and a lot of help from volunteers. U.S. Ski and Snowboard is currently searching for more than 600 volunteers to help with the event. By comparison, last season Deer Valley recruited 175 volunteers for the 2018 FIS VISA Freestyle International Ski World Cup. To prepare for such a massive undertaking, Meg Horrocks, who oversees the volunteer effort across the three venues for U.S. Ski and Snowboard, started the search for volunteers in April. “We wanted to capitalize on some of the resorts still being open and that winter mindset,” she said. Ever since then, she’s been watching the numbers trickle in, with bumps in sign-ups when it snows. “I could tell if it was snowing out there even if I hadn’t looked at the radar,” said Horrocks, who works remotely from Killington, Vermont. She is hoping to have enough people to fill all 2,500 eight-hour shifts by Dec. 1, with orientation scheduled for mid-January. There are currently 340 volunteers registered for about 1,360 shifts. Marilyn Stinson, who oversees Deer Valley’s volunteer efforts, said she has received applications from places as diverse as Canada, Colombia and Europe, but she said the majority are from the Park City area, including some who come yearly. The volunteers also get perks – they accumulate two day passes redeemable at any of the three resorts, for the first four shifts they work, which is the minimum, then two additional passes for each two additional shifts. They also get uniforms, like winter jackets, that serve as functional memorabilia from the event. But Horrocks said it’s not just about the perks. “When we ask people why they want to volunteer, of course they’re going to say something we want to hear, but there is an excitement about, ‘I’m proud of my community; I’m excited to show off my community; I’ve done it for X number of years and I love being part of it,’” she said. According to Katherine Hughes, volunteer coordinator for Park City Ski and Snowboard— which is helping Park City Mountain find workers — the ideal candidate has plenty of free time and is thrilled for the event itself. The time commitment can make it difficult to find volunteers, especially since most of PCSS’s member families have two working parents. Horrocks, who is the volunteer organizer for the Alpine Ski World Cup in Killington, said she usually sees a sharp uptick in volunteer registration in the last weeks before the event. Some will arrive as early as three weeks out to help greet and train other volunteers. The volunteers will be stationed in places as far as Salt Lake City International Airport, and as centrally as the aerials hill at Deer Valley, which will be home to the first team aerials competition at a World Championship. In fact, the combination of events itself is something of a first, even though this is the third time Deer Valley has hosted the freestyle World Championships. According to a press release from U.S. Ski and Snowboard, the 2019 World Championships will be the first in the U.S. to include all events across snowboard, freestyle and freeski disciplines. When it comes, Horrocks said everything will be ready – from the slopes to security. “We will not be short staffed,” she said. To volunteer, go to 2019worldchamps.com. Events will run Feb. 1 to 10.